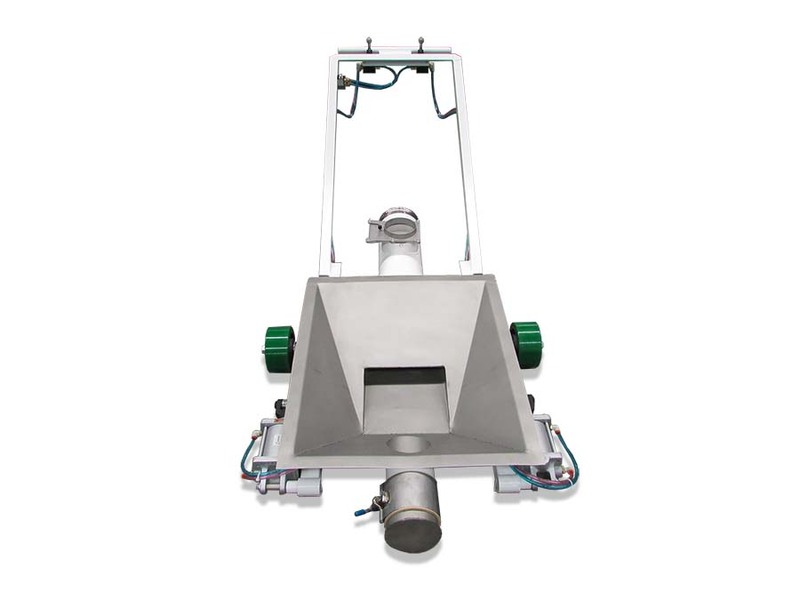 Rail Car Discharge Adapter (RCDA) can be used to transition from the rail car’s hopper discharge gate to a vacuum pneumatic conveying line. This device can be inserted between the gate and grade. 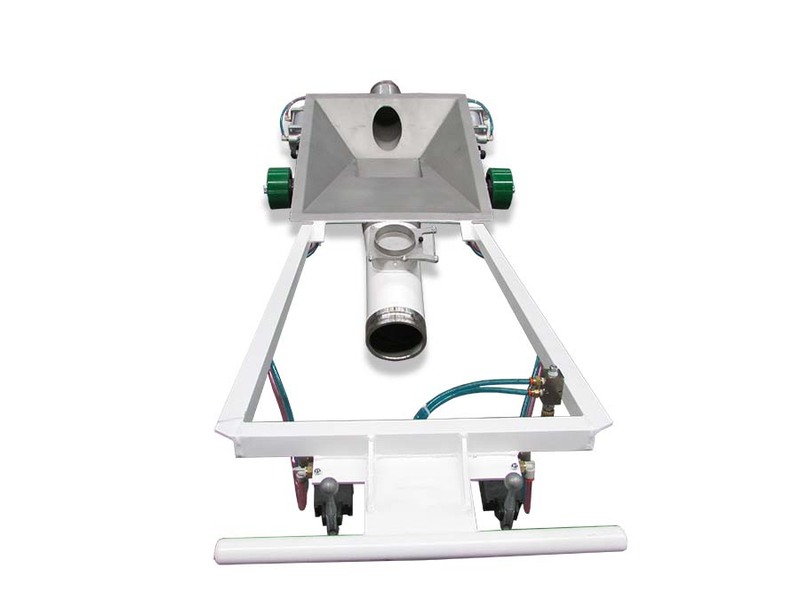 It serves as a transition to a pipe stub (4” to 8” line) with a hose fitting, allowing flexibility in positioning of the car by using a flexible hose connection to attach to a trackside pipe manifold where the material can be vacuumed out of the car to its destination or transitioned to a pressure conveying system where it can be sent on to farther distances and/or multiple destinations more efficiently. 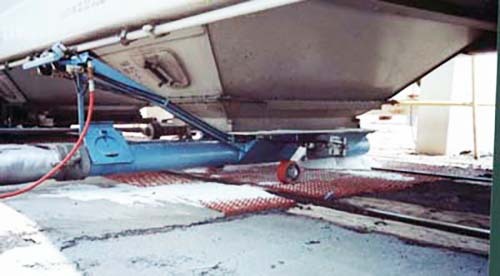 Each adapter also includes a bleed-air gate to allow for manual balancing of the material-to-air ratio of the conveying system at the pick-up point. These adapters come in two basic types: A manual clamp style and a single operator sled style. In the clamp style usually two operators go out and manually clamp a ~175 pound RCDA to the discharge gate frame and then attach a hose to it. 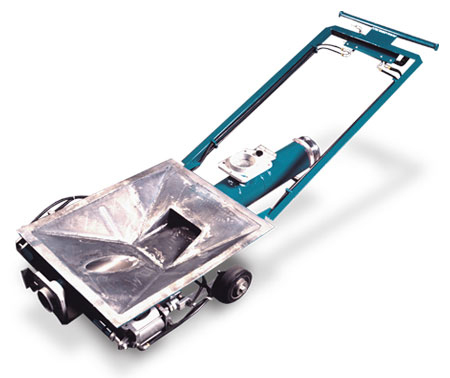 In the sled style unit a single operator can take a unit on wheels that is retracted to a low profile (7” to 9”) and then raised up to form a dust tight connection when under the car. (Note: pneumatic cylinders are provided to allow the RCDA to rise with the car as it losses weight from unloading and raises on its shocks). This type of unit is easier to operate, but does require a fairly even surface near the tracks to be pushed around on.